Are we Living in a Golden Age of Mesmerism? This is part of a special series of posts on the digital history of psychology from members of the PsyBorgs Lab at York University, in Toronto, Canada. The full series of posts can be found here. Digital history seems hard to a lot of people. All those fancy computer programs to count and filter and graph data seem complicated and difficult to learn. But it need not be that way. You can get started on basic digital history of psychology right now with nothing more complicated than the web browser you are using to read this message. Let me show you how: First, go to the Google Ngrams web page (in another browser tab, so that you can continue to read this post as well). Ngrams is a program that scans the vast holdings of Google Books for words that you select, and then plots them on a line graph. 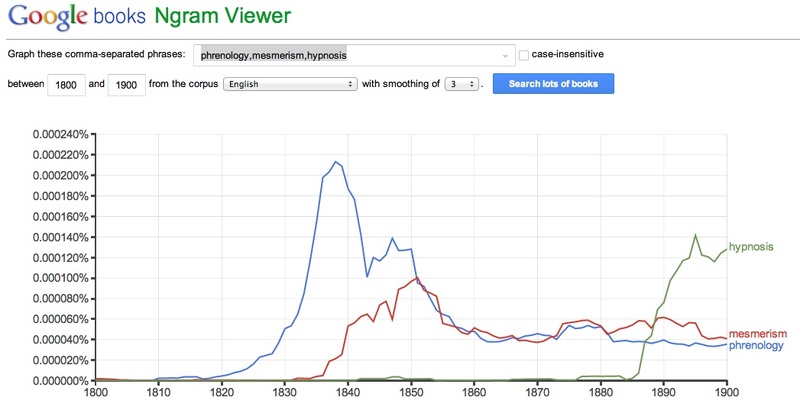 When you have the Ngrams page up, delete the default words “Albert Einstein,Sherlock Holmes,Frankenstein” from the search box and replace them with the words “phrenology, mesmerism, hypnosis” (no quotation marks, but be sure to include the commas). Set the date range to between 1800 and 1900. Make sure the corpus is set to “English,” and leave the “smoothing” at the default value of 3. Click on the “Search lots of books” button. You can see that immediately see that phrenology had its peak popularity (in English-language published books) in the late 1830s, and then began to fall off rapidly. It is important to note, on the y-axis, that this peak was only about 2/10,000ths of a percent of all words that appeared, but that was its peak none the less. It also had a secondary peak in the late 1840s, at just about the same time as mesmerism began its own rise. Indeed, some people of the time (including Ada Lovelace of computing history fame) wrote of “phreno-mesmerism”; the two practices began to merge in the public mind. They both fell off in the 1850s to a kind of “background” level of about 4/100,000ths of a percent for the rest of the century. In about 1885, however, a new discipline called “hypnosis” began to rise, surpassing both of the older practices in the late 1880s, and reaching its (19th-century) peak in the mid-1890s. 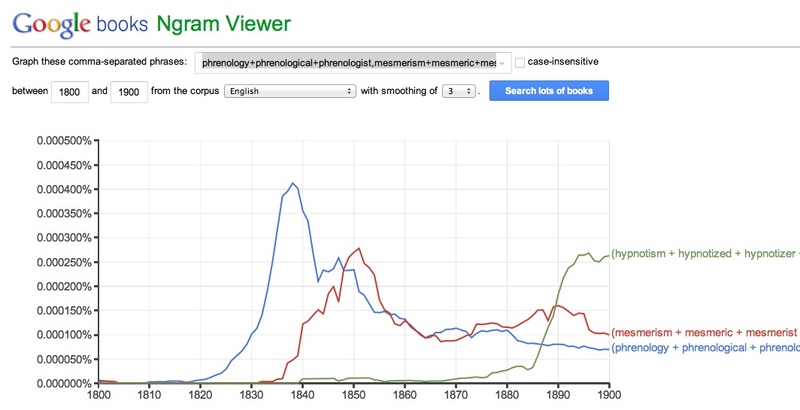 This graph is not that different from the first one, except that the main peak for mesmerism and its variants (let’s call this mesmerism+) now exceeds the secondary peak for phrenology+ around 1850 (because, as it turns out, “mesmeric” was actually used more frequently than the base term “mesmerism”). Note also that there is a bit more of a secondary peak for mesmerism+ around 1890.